Slay a bandit leader for Siddgeir, the Jarl of Falkreath. "The cut they were giving me was good at first, but now it's time to clean things up." This is a radiant quest which is received from Siddgeir if he is the Jarl of Falkreath. The bandit camp is chosen from the following list: Bilegulch Mine, Cracked Tusk Keep, Embershard Mine, Knifepoint Ridge, Bannermist Tower. Speak to Siddgeir, the Jarl of Falkreath. Travel to the assigned dungeon. Travel to Falkreath and talk to Jarl Siddgeir in order to initiate this quest. The quest will involve you traveling to an assigned dungeon and killing the bandit leader, which at low levels can prove quite a challenge. After traveling to the assigned dungeon you will only have to kill the bandit leader of that dungeon, killing the lesser enemies is not mandatory, but would make your job easier. Return to Siddgeir to collect your reward of gold. Siddgeir is the only Jarl of Falkreath who gives this quest, which is the last prerequisite he requires before starting the Thane of Falkreath quest. 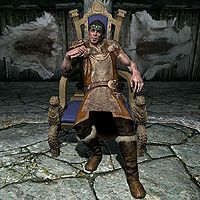 If Dengeir is jarl, then he will already consider you a friend, and start that quest without any further prerequisites. The quest will not be available if you have another "kill the leader" bounty quest active. On the PC, it is possible to use the console to advance through the quest by entering setstage Favor154 stage, where stage is the number of the stage you wish to complete. It is not possible to un-complete (i.e. go back) quest stages, but it is possible to clear all stages of the quest using resetquest Favor154. This page was last modified on 20 December 2016, at 10:19.